No, the best sandwich in New York is not a pastrami sandwich from Katz, or any other classic New York delicatessen. 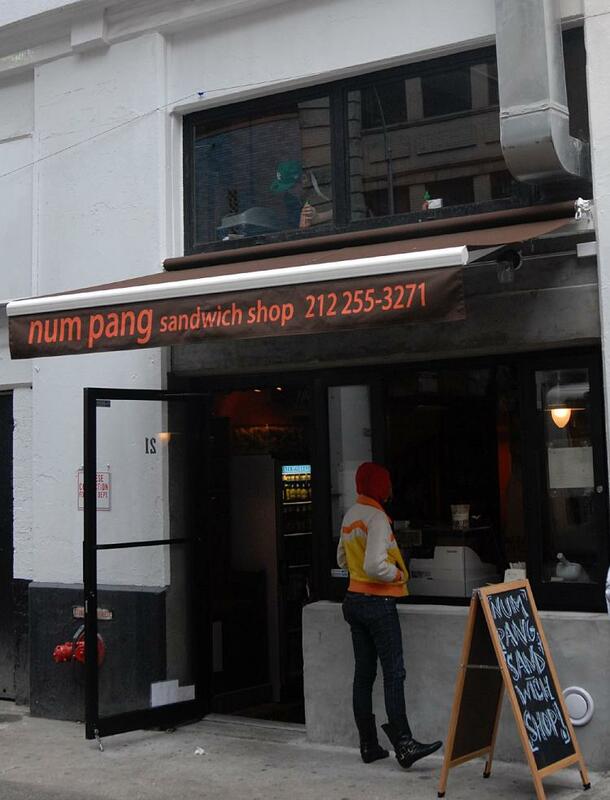 Zagat gave the award to this quick and informal Cambodian sandwich shop near Union Square, on University and 12th Street. 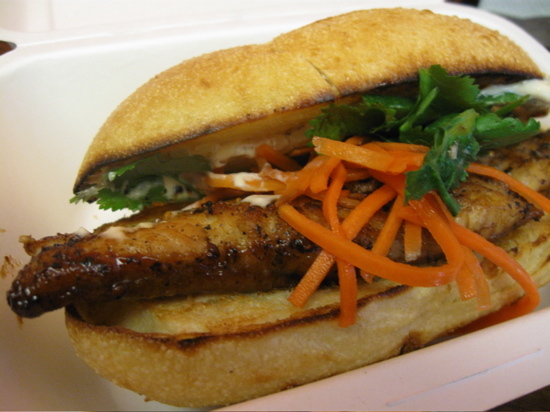 The sandwiches are an interesting fusion of European and Asian cuisine. While the legacy of French occupation has influenced this particular Cambodian food item, the meat and veggies within the sandwich have a very particular Asian flavor. The foundation of Num Pang is the soft, freshly toasted baguette roll, while the flavors inside the sandwich can vary from sweet Asian sauces to spicy styles of meat familiar in Thai restaurants. Inside, each sandwich comes with a homemade chili mayo sauce, cilantro, carrots, and cucumber. The sauce complements the meat with both a creamy essence and a bit of heat. Similarly, the veggies do not distract from the flavor of the meat, but give the sandwich an interesting crunchy texture. The Pulled Duroc sandwich is very sweet. The quality and taste of the pork itself is quite good, but the base of the dish is a spiced Honey sauce. If you enjoy foods like sweet flavors with meat, like sweet and sour sauce or teriyaki, you will enjoy this. The Grilled Khmer Sausage sandwich takes a different approach. The sausage was leaner and thicker than the pork. The taste was characterized by a bit of spice and heat, as well as the smoky, lean taste of the sausage. Even as an avid lover of sweet foods, this sandwich was the better option. In addition to the sandwiches, there are a multitude of interesting Asian drinks, ranging from teas, Ginger Beer, and watermelon juice. I personally recommend the “blood orange lemonade”. The restaurant itself is designed for take-out and on to go eaters, but there is a small eating area on the second floor if you feel like sitting down. The restaurant can be a bit busy sometimes, but it’s well worth the wait.